Mr. Coleman began his legal career as a Judicial Law Clerk to the Honorable Mary Grace O'Brien in the Prince William County Circuit Court. The clerkship offered an invaluable experience to learn about the litigation process from within the courthouse. 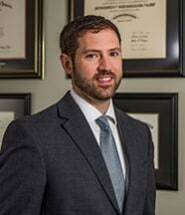 Upon completion of his clerkship, Mr. Coleman accepted a job in Fairfax as a trial attorney with a major insurance company where he spent 6.5 years aggressively defending complex personal injury and wrongful death cases. Mr. Coleman returned to Manassas and joined Kevin Locklin on the plaintiff side in January of 2017. As a former insurance defense attorney, Mr. Coleman is well versed in the tactics that insurance carriers frequently use in order to deny claims and he will effectively negotiate settlements or try cases when the insurance company refuses to make a fair offer. Mr. Coleman's experience defending personal injury cases will help to prepare clients for depositions, defense medical examinations, and trial. A native of Falls Church, Virginia, Mr. Coleman now lives in Annandale with his wife and dogs. Mr. Coleman's hobbies include traveling with his wife, playing adult league ice hockey and soccer, and mountain biking.